Big Money Bigfoot plays on the legend US players are surely familiar with. The myth of Bigfoot comes alive in this big money slot from RTG. The slot lives up to its name and give slot players great opportunities to win big. The five-reel, three-row grids with 25 paylines and an RTP of up to 97% is a good choice for real money slot lovers. Our review looks to explore Big Money Bigfoot’s fun game play and bonus features. 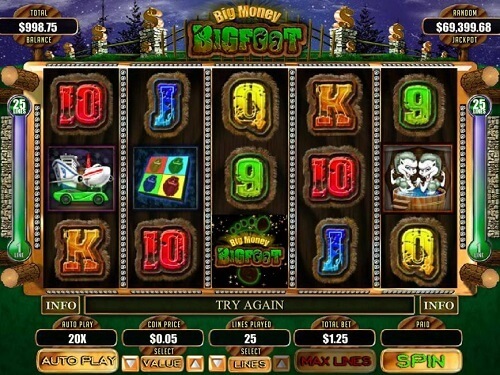 Big Money Bigfoot is not loaded with fancy gameplay features, however, there are plenty ways to win loads of cash in this game. The reels are set against a jungle with dollar bills all around. This speaks to the game’s Big Money theme. There is a total of 11 symbols and players can win up to 2000x their bet when they land winning combinations with the Wild. A winning combination with image of Bigfoot multiplies your bet by 1500. The game’s scatter symbol, is the logo which triggers the free spins feature. The free spins are the only bonus feature in the Big Money Bigfoot. Landing three or more scatters on the reel’s awards five free spins. Additionally, the scatter symbol turns other symbols wild increasing the potential for making meaningful real money wins. Another bonus feature is the random progressive jackpot which increases throughout the game. As we mentioned before, it’s a random jackpot and we aren’t exactly sure how it is triggered. Maybe this was RTG’s go at maintaining some of the mystery of the legend that inspired this fun slot. So, is the Big Money Bigfoot slot worth your time money? We think so, it’s simple enough without being boring. RTG kept the focus on the money and made the symbols a great way to rake in big wins with the huge multiplier boosts. Over and above that there is a random progressive jackpot which adds in extra potential for life changing wins. Alternatively, you could try the game out in free play mode on your mobile or desktop before you play for money.